Macsween Three Bird Haggis and Venison Haggis is here! 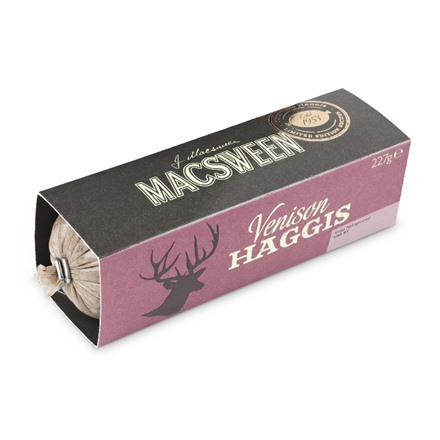 To celebrate their 60th anniversary, Macsween has launched not one – but two – limited edition flavours – Three Bird haggis and venison haggis. Delicious, versatile and available from us now in our online haggis shop! These limited edition haggis are the latest products in James and Jo Macsween’s successful evolution of Scotland’s traditional dish. The Macsween Threebird haggis is an elegant trio of grouse, pheasant and duck, subtly smoked with quince, lavender and spices – the most succulent and fragrant haggis we have ever made. The Macsween Venison haggis is wonderfully moreish, infused with port, juniper, redcurrents and spices for a meatier, rich flavour. They make a wonderful edition to festive feasts. Try the Venison haggis as an accompaniment to steak, use the Three Bird haggis as a stuffing or impress party guest with one of our canapé or starter recipes. We had a family tasting and they really are delicious. But when Macsween say ‘Limited Edition’ they mean it. James Macsween has handmade less than 2,500 so they really will be gone before you know it, so stock up whilst you’ve got the chance. Your threebird haggis or venison haggis is only two clicks away.